IT IS hard to beat the harmonies and depth of songwriting of Bennett, Bowtell & Urquhart as the trio launch their album, Weeds, tonight, September 14, at the Acoustic Picnic in Sydney. “Recording this album was easier this time because we know our sound and roles now and we all understand the space we have to leave, too,” Felicity Urquhart said. FROM the rolling hills of Picton to the mine trucks of Paraburdoo, singer-songwriter Jemma Beech has experienced it all this year, and her experiences have resulted in her stellar debut album, That’s Just Me. Released on Friday, September 7, That’s Just Me is a culmination of songs from Jemma’s life up to now with plenty of cheekiness and girl power thrown into the mix. The 25-year-old country artist moved to driving mine trucks in the Pilbara in March this year and her songwriting has flourished. Working seven days on, and seven days off has meant Jemma can concentrate on music on her days off and dedicate a block of time to her craft and gigs. “I’ve enjoyed the new experiences that the move has brought,” she said. NASHVILLE singer-songwriter Devin Dawson spoke with Rebecca Belt about expressing his truth through country music and the lyrics of the tracks on his album, Dark Horse. TRAVIS Collins will take a message of healing to the stage this weekend as he begins touring his new album, The Brave and the Broken. This album is not his first rodeo, but the day prior to release he told The Country Journo’s Rebecca Belt that he was more nervous and excited than when he released his debut offering all those years ago. “It’s such a huge effort this record and such a true reflection of where I’m at with my music and my life,” Travis said. THE Gympie Music Muster kicks off this week – August 23 – and continues to give back to rural communities who are doing it tough. Muster spokesperson Lori Hoffmann said rural communities have been suffering in these dry times. “Depression and isolation become more prevalent, spending in regional towns decreases and the knock-on affect is widely felt,” she said. Seventy-five percent of 2017 Muster-goers travelled from outside the region to attend, contributing to an overall economic impact of $6.20m for Queensland, 83% of which was felt in the greater Gympie region. “The Muster has always been about community coming together,” Lori said. 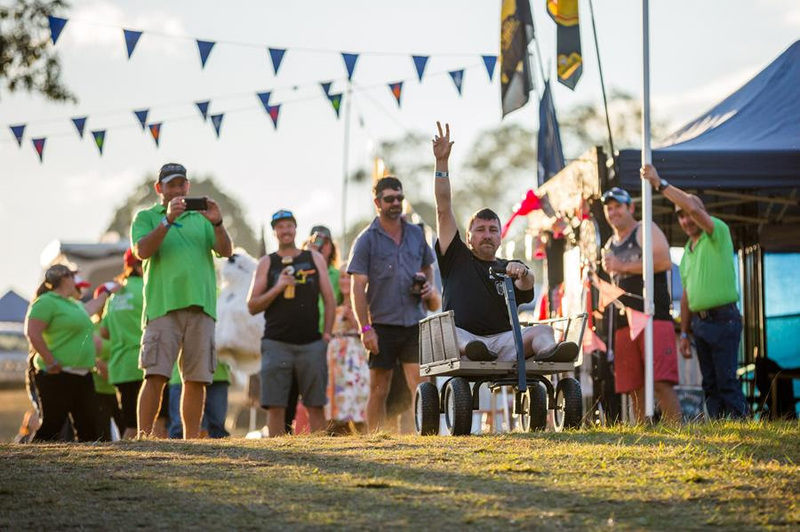 In the lead-up to this year’s festival, the Gympie Music Muster donated 30 four-day festival tickets to Drought Aid to bring drought-affected landowners to the event, and will also shout them a feed at the Muster’s Biggest Ever Bloke’s Lunch hosted by 2018 charity partner Prostate Cancer Foundation Australia. The Muster is a much-needed helping hand for those regional communities doing it tough. YOUNG singer-songwriter Grace Mae is already ticking off items on an extensive list of goals, with the release of her debut single, Not Today. Not Today shares Grace’s philosophy of walking away from things in your life that make you feel unhappy or aren’t right for you as a person. “I know you don’t always have much control over some of the big things in your life, but we can look after the little everyday stuff ; friendships, bullying, choosing to do the right thing – it’s not always easy to stick up for whats right for you,” she said. TAMWORTH has witnessed plenty of massive concerts and big name artists, and the crowds turned out again in April to welcome US country stars Kip Moore, Lee Brice and Charlie Worsham. Thousands of people packed the Tamworth Regional Entertainment and Conference Centre for a night of country music celebration with three of the biggest names from the US, and they shared it with their fellow country lovers. It’s a night that left many with sore heads but, most of all, wonderful memories of witnessing moments that may never be repeated in the Country Music Capital. GOLDEN Guitar winners Tom Curtain and Sara Storer are taking a stand against bullying with their new duet, Speak Up. Tom wrote the track to raise awareness of bullying, after victim Amy “Dolly” Everett ended her young life earlier this year with the track reaching No. 5 on the iTunes Country Songs Chart on release day, June 18. TOP selling country artist Kip Moore may be one of the biggest names in his home country, the USA, but Australia holds a special place in his heart. He rekindles his relationship with his fans Down Under this week as he begins his Australian tour with a show in Winton with musical mates Lee Brice and Charlie Worsham. As a special treat for regional fans, they will play shows in Winton, Queensland and Tamworth, NSW as well as city shows in Melbourne, Sydney and Brisbane. “Australia has got a piece of my heart; it is special for me,” he said.